Bell peppers are one of the most popular vegetables grown in home gardens. The bell pepper is native to Central and North America and is easy to grow. There is now a much wider variety of peppers to choose from with different colors and even different shapes. Whether you’re looking for green, yellow, orange, red or even purple; here’s what you need to know. Peppers like hot weather. They are easily damaged from any cold weather and frost is fatal. If you live up north, utilize items such as plastic mulches, row covers, hoop houses and anything else you can find to quickly grow this wonderful plant before the weather gets cooler. You will want to start the seeds indoors first and transfer them to your garden when the soil is warm and the weather is right. Plant the seeds in pots about two inches in size. Larger pots will allow the roots to develop better and offer a more stable plant when it’s time to transfer them to the garden. Place seeds about 1/4 inch deep in moistened, lightweight mix. Keep them slightly moist and warm. Plants will germinate in about 6-8 days. Thin the plants to one per pot after the first true leaves have appeared. Using bottom heat or heat lamps to keep the soil warm will promote better and quicker germination. Do not water seedlings directly. Rather, immerse the tray or pots with holes in a pan of water about 1/2 inch deep. Allow the seedlings to drink for a few minutes, but do not let them become soaked. Seedlings need lots of light. Supplement with fluorescent lights if necessary to avoid tall, weak plants. Many gardeners plant transplant their seedlings too early. Wait until the soil is between 70-85 degrees. If the weather is still too cold, wait until it warms up. Cold weather can lead to the plant slowing down or becoming stunted. Determine a good spot to plant your new plants outside and prepare the soil. Bell peppers need lots of nitrogen, potassium and phosphorus. The area should be well-drained and receive lots of sun. Prepare the soil by adding good topsoil, compost and rotted manure. You want a pH level around 7.0 (neutral). Rake the soil, removing large rocks and leveling it out as you go. Place the seedlings that you started indoors 18-24 inches apart. Dig a small hole, about 2 inches deep, with your trowel. Gently but firmly grasp the seedling by the base of the stem and lift it out (dirt and all) from the starter container. Place the root base of the seedling (with dirt still around it) into the hole, making sure the root ball is completely within the hole. Add about 1 inch of water into the hole, and fill in with soil, patting firmly around the base of the seedling, tamping it securely into the ground. Surround each plant with mulch to warm the soil and help keep the soil moist. To improve the quality of your peppers, place a small amount of fertilizer around each plant early in the growing season. Place the fertilizer about 4 inches from the stem and add water to work it into the soil. When watering your plants, you want to keep a consistent moistness to the soil, but do not allow it to get soggy during the growing season. If the plants do not get enough water, the bell peppers will have a bitter taste. If you use a black plastic mulch, you will need to water the plants more frequently. As the plants grow and develop, switch from mulch to a fertilizer that is high in phosphorous and potassium. Avoid giving the plant too much nitrogen as this can results in a great bushy plant, but few peppers will develop. Bell peppers generally take 70 to 90 days to mature. Determining when to harvest your bell peppers depends upon the type of pepper you are looking for. Most bell peppers are green when they are immature, but can still be harvested at this time (as long as they are of edible size). Peppers are mature when they become their final color. The color depends on the variety and can be red, orange, yellow, green or purple. When removing the pepper from the plant, use scissors or shears to clip them off rather than pulling them off. You can encourage new growth and a continuous production of fruit by regularly harvesting the bushes. The plants will continue to produce until the weather gets too cold. After you have picked your peppers, wash and dry them thoroughly. They will last up to three weeks if stored at 45-55 degrees with 90-95 percent relative humidity. Peppers are self-pollinators. Sometimes bees or other insects will cross pollinate them with other plants. Because of this, keep hot and sweet peppers far apart. It will not affect the current crop, but if you keep the seeds, it will show up in the genetics the following year. Several insects like to feast on pepper plants. Spider mites, aphids and occasionally borers are the main culprits. Others include the Colorado potato beetles, tarnished plant bugs, flea beetles, and hornworms. Fortunately, it’s not a frequent problem and can easily be cured with an organic insecticide or dust. Common diseases for bell pepper plants include anthracnose, blossom end rot, bacterial spot, early blight and verticillium wilt. Protect pepper plants from frost at all costs. Cover plants if frost is expected. An easy cover is a 5-gallon bucket. Just place them on top through the night and remove when the air warms up during the day. Peppers are sensitive to ethylene gas (a gas given off from other fruits and vegetables as they ripen). Do not store them with other fruits and vegetables that produce ethylene gas, such as apples and strawberries. 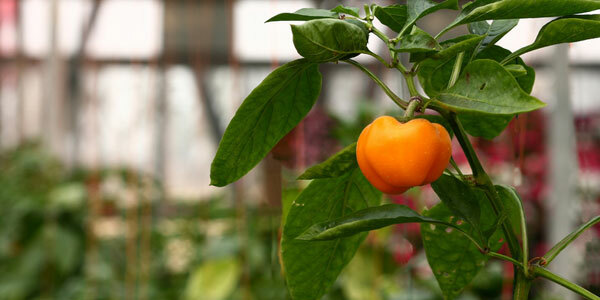 Do not plant bell peppers with other Solanaceae plants such as tomatoes, potatoes, eggplant, etc. as they are susceptible to the same diseases. I need a tip, my folage is beautiful, but I have very few flowers and no fruit. I have the same problem. This year I have beautiful healthy plants with very few flowers and fruit. One website suggested they might have been overfertilized. Any thoughts? I have heard that you should keep the roots contained in pots that are not too large for maximum fruiting, so the nutrients go into the production of fruit rather than the plant’s development. Sounds like you guys have too much nitrogen in your soil! I’m getting lots of peppers but my plants didn’t get as large as last year. Any tips on how I can help my plants grow bigger? I have a question: Our bell peppers have gotten sunken, withered brown spots on them. They were doing well until I noticed these spots, first on one pepper, then I started seeing the same spots on the others, any ideas? Too much water? They are planted in a large pot container. Thanks! Myriam, your peppers might be getting sunburned. Are they out somewhere where they get loads of sunshine? Try getting them some shade during the midday hours or you can try pruning the plants to encourage more branches, and therefore, leaves that can provide more shade to the fruit. I had a lot of problems with this with golden wonders that I grew this year. My new transplants have turned brown at the base of the stem, and have gradually withered and died. I removed the buds from my youthful bell pepper plants early in June to encourage more plant growth, like with tomatoes, but they don’t look too happy about it. Was this wrong? Will my plants produce anymore?